A new report issued by Human Rights Watch notes that most U.S. states use execution methods that needlessly risk excruciating pain for inmates subjected to lethal injections. The report examines the history of lethal injections and the widespread use of protocols that were created three decades ago with no scientific research. Although supporters of lethal injection believe the prisoner dies painlessly, there is mounting evidence that prisoners may have experienced excruciating pain during their executions. This should not be surprising given that corrections agencies have not taken the steps necessary to ensure a painless execution. They use a sequence of drugs and a method of administration that were created with minimal expertise and little deliberation three decades ago, and that were then adopted unquestioningly by state officials with no medical or scientific background. Little has changed since then. As a result, prisoners in the United States are executed by means that the American Veterinary Medical Association regards as too cruel to use on dogs and cats. (Executive Summary). Although supporters of lethal injection believe the prisoner dies painlessly, there is mounting evidence that prisoners may have experienced excruciating pain during their executions. This should not be surprising given that corrections agencies have not taken the steps necessary to ensure a painless execution. They use a sequence of drugs and a method of administration that were created with minimal expertise and little deliberation three decades ago, and that were then adopted unquestioningly by state officials with no medical or scientific background. Little has changed since then. As a result, prisoners in the United States are executed by means that the American Veterinary Medical Association regards as too cruel to use on dogs and cats. (Part IV, footnotes omitted). Human rights law is predicated on recognition of the inherent dignity and the equal and inalienable rights of all people, including even those who have committed terrible crimes. It prohibits torture and other cruel, inhuman or degrading punishment. Human Rights Watch believes these rights cannot be reconciled with the death penalty, a form of punishment unique in its cruelty and finality, and a punishment inevitably and universally plagued with arbitrariness, prejudice, and error. Thus our first recommendation is that states and the federal government abolish the death penalty. If governments do not choose to abolish capital punishment, they must still heed human rights principles by ensuring their execution methods are chosen and administered to minimize the risk a condemned prisoner will experience pain and suffering. As state lethal injection protocols have never been subjected to serious medical and scientific scrutiny, Human Rights Watch recommends that each state suspends its lethal injection executions until it has convened a panel of anesthesiologists, pharmacologists, doctors, corrections officials, prosecutors, defense attorneys, and judges to determine whether or not its lethal injection executions as currently practiced are indeed the most humane form of execution. (Recommendations). 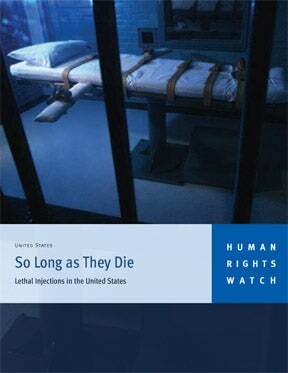 Read the full report: So Long as They Die: Lethal Injections in the United States (April 24, 2006). See also, Methods of Execution and DPIC's page on executions stayed and carried out since January.